Hearty, healthy, and the kitchen sink of recipes, a bowl of steaming chili is the perfect cold weather entrée. While I was home for Christmas, I flipped through my mom’s copy of Real Simple magazine and came across a recipe for vegetarian chili with sweet potatoes. “Sweet potatoes and veggie chili?” I thought. “Two of my favorite foods, together? !” The recipe shot to the top of my mental to-cook list as I tore out the pages for safekeeping. Usually when I make veggie chili, I’ll use all the vegetables I have on hand, and throw in whatever kind of beans and tomatoes that are in my pantry. This time around, I mostly followed the recipe, and it turned out fabulously. 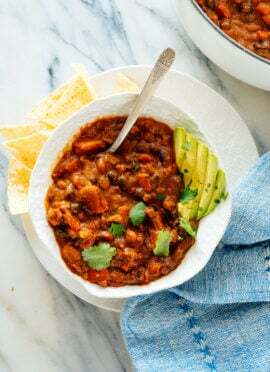 Extraordinary vegetarian chili containing sweet potatoes, black and pinto beans, peppers and cocoa powder. A wonderfully delicious, hearty & healthy vegan meal. Recipe yields 6 bowls. 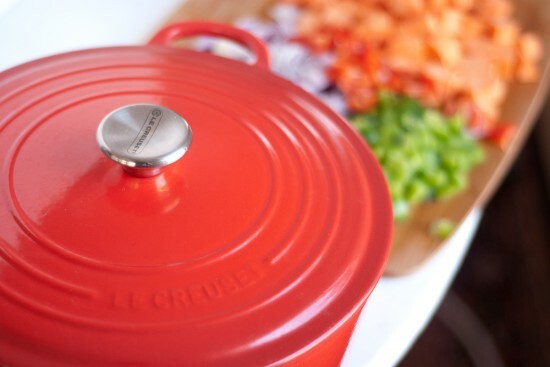 In a 4-to-6 quart Dutch oven or stockpot over medium heat, warm the olive oil until shimmering. 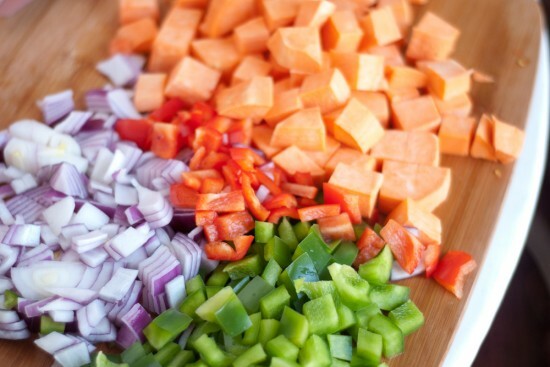 Add the chopped vegetables (onion, peppers and sweet potatoes) and a sprinkle of salt and pepper. Cook, stirring occasionally, until the onions start turning translucent, about 3 to 5 minutes. Reduce the heat to medium-low. Add the garlic and spices (chili powder, cumin, cayenne, cocoa powder, cinnamon, and another dash of salt and pepper) and liquid ingredients (tomatoes, beans and broth), and stir. Bring the mixture to a gentle simmer. Cover and cook, stirring occasionally and reducing heat as necessary to maintain a gentle simmer, until the sweet potatoes are tender and the chili has reduced to a heartier consistency, about 45 minutes to 1 hour. If you would like an even thicker consistency, use a potato masher to mash the chili until the texture suits your preferences. Season chili with salt and pepper to taste. Divide the chili into individual bowls, garnish as desired and serve. *A note on canned tomatoes: I’m concerned about the BPA levels in canned tomato goods and avoid canned tomato products as best I can. I recommend using Muir Glen canned tomatoes because their cans are BPA-free. Slow cooker/Crockpot option: This chili should turn out well after cooking on low for 7 to 8 hours, or on high for 4 to 5 hours. 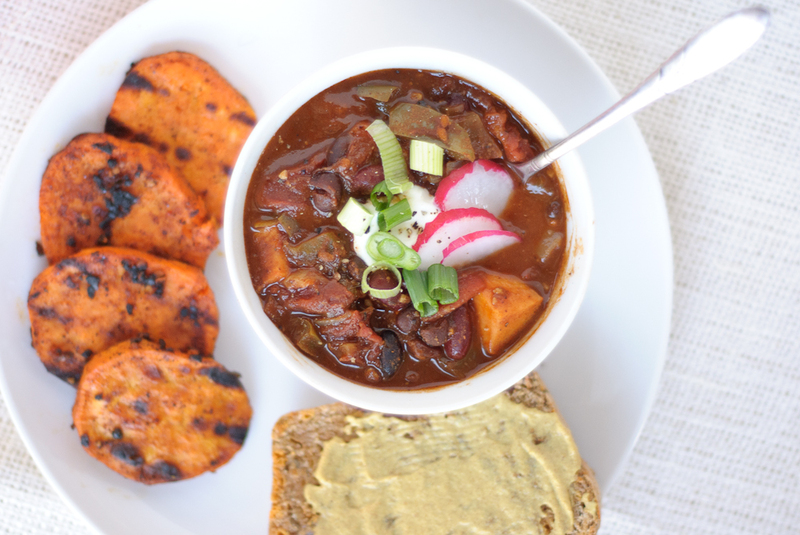 Have you ever tried sweet potatoes in your chili before? You must, I insist! This chili was fantastic and I even shared it with co-workers. They are now gonna cook it at home. Wonderful! Thanks so much for sharing this, Tee! I’m so glad everyone enjoyed it. Rather than commenting with a “looks good or sounds good” I have made this and often. No need to “alter” or “substitute”. This is delicious comfort food! Easy to put together. Thanks for commenting, Elizabeth! I’m glad it worked out well. I’ve made this recipe several times and I love it. It is so good and so healthy. I don’t add the broth as I feel it has enough liquid when you cook it on low. The sweet potatoes are really what gives it that great flavor. Thank you for sharing this. Awesome! Thanks, Carol. Good to know about the liquid. Delicious, I use plain Greek yogurt instead of sour cream to garnish. I am looking forward to making this recipe this weekend! I am wondering whether you used a sodium-free vegetable broth, or a vegetable broth with salt? Also sodium-free vs. diced tomatoes with salt? Thanks so much! – E.
Hi Erica! I don’t usually grab the low-sodium options. But, you can certainly use low-sodium ingredients and just season to taste with salt at the end—you’ll need to add more than just a few dashes of salt to properly season recipes. I made this in my instant pot this evening ….. it was FABULOUS!!!!! My friend made this recipe the traditional way and it was AMAZING!! I am DYING to try out my new Instant Pot and would love to start with this recipe. As I am a total newbie to pressure cooking, would you mind letting me know how you adjusted the recipe to suit? Also, how long did you cook it? Thank you! I made this for dinner last night and it was delicious! It was the easiest sweet potato chili recipe I’ve tried thus far (I’ve tried 4 recipes). I pureed 1/3 of the mix with my immersion blender which thickened it like you noted. Will make this again. Thank you! Great! Thanks for trying it, Julia. I really appreciate your review! Just made this- amazing! Easy, healthy, and SO TASTY!!!! Great! Thank you, Melissa for sharing and for your review. I am a Kansan who escaped to Texas as soon as I got out of college. I am a new Vegan and am looking for good recipes. Trying your chili! This chili was amazing – I am making another huge batch for the day after Thanksgiving for the crowd I will have staying over. Do you think I can make this today and freeze it? Happy you liked it, Lisa! I don’t freeze all of my recipes so I can’t specifically speak to how it would work. But, I have had other readers say they have froze it and it worked out well. Amazing!! My fiancé is not a big veggie person and while he does like all the veggies in this chili, he’s convinced himself he won’t feel full if he doesn’t have meat. This chili proved him wrong, it was very satisfying and filling! It was very inexpensive to make and we have plenty of left overs for lunch!! This is a lovely recipe but I followed exactly and a tablespoon of chilli powder is way too much! It was practically inedible! Are you sure that is correct? I had to pour yoghurt over it to be able to even eat it! I am sorry you felt that way, Helen! This chili is meant to have some heat. Maybe add the chili powder to taste next time. Possible add some in, let it simmer and see if you need to add some more. Hope this helps! Delicious! A delightful combination of spices. My favorite chili recipe. I have made this a few times now and it is absolutely delicious. I made it for my vegan daughter and her girlfriend but the whole family ate it and loved it. I also made it in a slow cooker for a girls’ night and it went down a treat. Wonderful to hear, Clare! Thanks so much for the review and trying the recipe. Great chili which I try to make weekly in the winter. I sometimes roast the sweet potatoes (which I toss beforehand with some o.olive and chipotle chili powder) then add to the stew during the last half hour. Gives it a nice smokey kick. This time around I also subbed red wine for the tomato juice and tossed in a couple of handfuls of frozen corn niblets. We added most of the fixings at the end, including putting out a bowl of lime tortillas chips. Yum. Oh, that sounds delicious and wonderful! I’m going to need to try that, Olivia. Thank you for sharing your variation and for your review! Delicious!! Excellent flavor, rich texture and feels like a cozy fire on a cold night. Made this for New Years Day and making it again tonight. Yes, I couldn’t agree more! Cozy. Thank you, Catherine for sharing and for your review. I’m really anxious to try your recipe with sweet potatoes. I’ve had a sweet potato chili before and it was delish: but it only contained black beans. Your’s seems much heartier. I’ll be back to tell you how it went!!! Glad you liked it, Jeanette! Thanks for the review. We are so excited to make this tomorrow. It looks amazing. Quick question, can this be made in an Instant Pot, and if so how would you tweak the timing of it? I don’t always make each dish in different cooking methods. I haven’t made this in an instapot myself so I’m unable to help you out there. Sorry! Hi Kate! I love your blog and your cookbook!! I want to make this, but I have a HUGE sweet potato that I’ve already roasted. Think it would be ok to use it? When would you recommend adding it? I’m guessing later since its already cooked, but I wanted to hear if you had any additional thoughts on the timing. Thank you! Since you already have it roasted, I’m assuming it is more of a mash consistency? If you are ok with that, I would add it enough to warm. It will likely not hold texture if roasted whole. If is is cubed already, that might be different. Hope this helps! Oh my gosh is this good! Followed the recipe to the letter and am enjoying this at the moment paired with a skillet cornbread recipe I found, coriander uncle bens rice, and Evan Williams… couldn’t be happier! 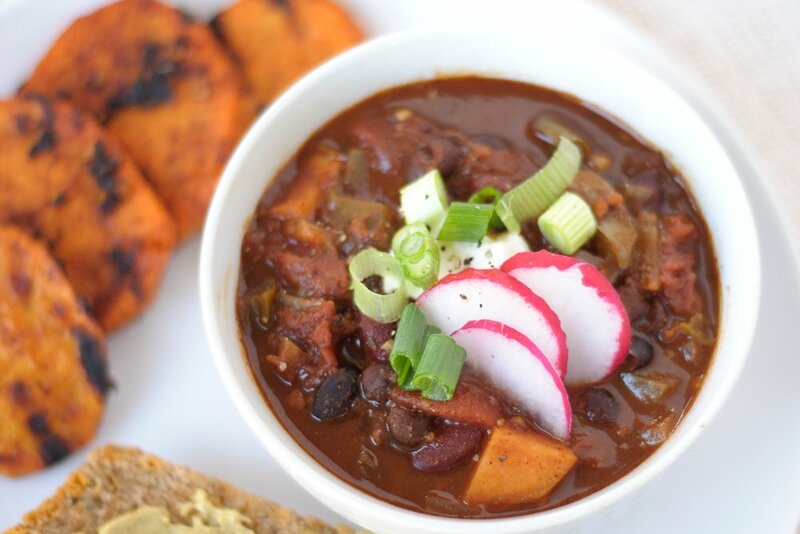 Thanks for this delicious sweet potato chili recipe, I know I will be making more! Sounds like a delicious combination, Mike! Thank you for your review and for sharing. This is one of my toddler’s favorite meals! Loved the sweet potato veg chili, easy to make also. Best chili I have ever had !!! Tried to make this tonight, I only added half the amount of chilli and cayenne pepper and found it too spicy, so I’m relieved I didn’t put the full amount in but I thought it was lovely when I was making it, then when I ate it later with my boyfriend I wasn’t too sure on it, I’m going to try it again sometime without the spicyness as I think we would both really enjoy it then! I really wanted to absolutely love it so going to try again and make sure that I followed the recipe completely right! Yes, if you are sensitive to heat please adjust. Did you make this with yams or sweet potatoes? I made it with sweet potatoes as the recipe stated but the pictures appear to show yams. The taste was a little strange as I made it so I am wondering if that’s why. I used sweet potatoes. I’m sorry you didn’t enjoy the flavor! Thank you, Mark! It’s a great go-to soup for sure. I’m so happy to hear that! Thanks for sharing, Hayley. For people asking about the instant pot – i tried it out tonight! I’ve made this a bunch of times stove top and loved it but was craving it quick. I really have never converted something to pressure cook so I just figured I’d wing it. Kept everything basically the same but had lots of sweet potato (half gallon bag filled with it diced). Manual for 20 minutes – natural release for 5. Verdict? Delicious but no evaporation so it was soupy. I blended half to thicken and popped it on the sautee function for a bit. Added back in the non blended half and it was all the flavor in a thick chili like stew. I loved it. Thank you for sharing! I appreciate the review. This was fantastic! The cinnamon and cocoa gave it some real depth. This chili has excellent flavor and great texture! Unfortunately, I didn’t realize until too late that the vegetable flavoring had a tiny bit of gluten in it … so after making, I could not serve to the dinner guest it was intended for! But the rest of us thought it was outstanding! I’m sure it will be even better as tomorrow’s leftovers! Oh no! What did you use? This should be naturally gluten free as long as the broth you used was fine. I’m sorry to hear that, Joanie! But thanks for sharing. Wow! I have to say- I was skeptical about the cacao powder in chilli… but this is THE BEST chilli I have ever made. So delish! Thanks for the recipe! I made this recipe for a family get away weekend to the mountains. It was easy to make and it was a big hit with everyone. I only used 1/4 teas. of cayenne as there were small ones with us. All the toppings made it your own dish, especially like the vegan sour cream and avocados. Great healthy dish with lots of superfoods in it – will make again, thank you!! Made this for a weekend trip with our grown kids and their families. It was fast and easy to do, I forgot the instant pot but was fast on the stove top. 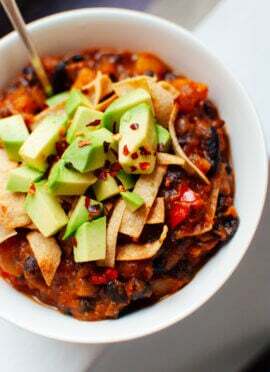 Delicious flavors in this dish make it a stand out among 1000’s of vegan chili recipes. My grown daughter loved it and said she does not usually care for sweet potatoes, everyone had two helpings. Vegan sour cream,avocado, green onions, cilantro plus other toppings were a hit!! thanks for the recipe – Will make this one again – it is full of SUPER FOODS!! This one has that magic for sure! Thanks for sharing, Suee! It was the best chili I have ever eaten. I would use less cayenne pepper next time as I not a fan of spicy. I’m glad you liked this recipe! For sure adjust to your taste. Thanks, Marine! This was delicious! I used butternut squash instead of sweet potato, and I used the crockpot on low for 8 hours. I also added a little lime to each bowl as I ate it. The combination of spices was really nice, loved the addition of cocoa. I’m glad this worked well in a crock pot for you, Amanda! I appreciate the review. This is my all-time favorite chili recipe! The sweet potato and beans make it very hearty. I have made it for my work chili cook-off and my traditionally meat-loving co-workers love it! They even asked for the recipe! At the end I use my immersion blender to thicken up the broth a bit! Hooray! I love that! Thanks for sharing, Nancy. Best vegetarian chili! The only change I made was 1/2 teaspoon of cayenne – otherwise I followed the recipe and it was perfect! Love this site! Looking to make a batch of this for the weekend but definitely want to use the crockpot. 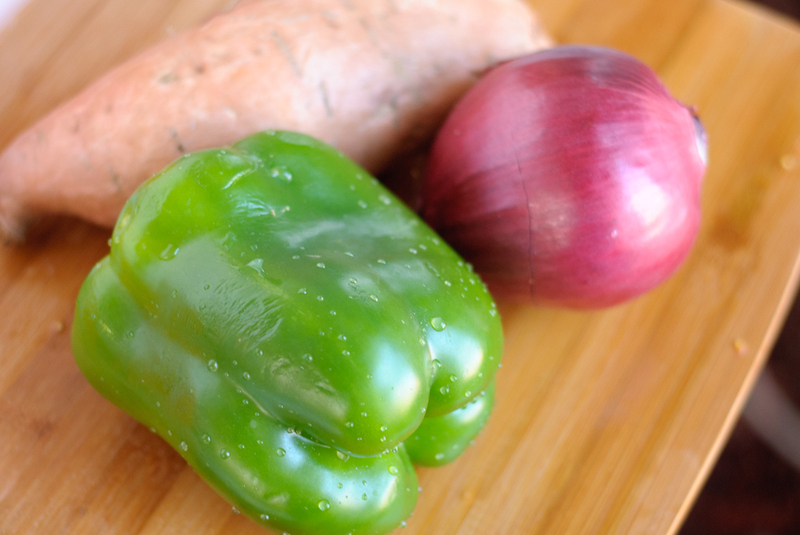 Since I’m a big dummy and don’t cook much, will I still need to cook my veggies before dumping them in the crockpot? Thanks! Hi Katie! I don’t make this with a crockpot but I know it’s worked well for others. Please follow the prep steps of the vegetables as it helps all the flavors meld. I also recommend looking through the comments to see what’s worked for others. Thank you, Brad! I appreciate your feedback and review. Honestly, this works really well with chickpeas rather than beans. I’ve found that if I don’t add the liquid from the chickpeas, it comes out better, with a heartier texture. Thanks for sharing! Yes, always drain and rinse your beans first. This was amazing! I love all the complex flavors of the spices. So good. Thank you! You’re welcome! Thanks for your review, Elizabeth. Thanks for sharing, Kami! I appreciate you sharing your variation. I made this tonight & it was delicious! What a fantastic quick & easy recipe that I will continue to make. Thanks for posting it! You’re welcome, Amy! I’m glad you enjoyed it. I’m happy you loved it so much! Thanks for sharing your thoughts, Laura. Omg!!! This was seriously amazing and you wouldn’t have to change a thing for it to be super tasty. I did add a chipotle pepper in place of the cayenne and also added 1/4 cup of ketchup and 2 teaspoons of Worcestershire for richness. Thanks Kate! I’m happy to hear you loved it, Tanya! I’ve made this a few times, more recently in an Instant Pot. Nice, deep flavor profile! Love this one! This is a wonderful recipe. I used V8 Spicy juice because I didn’t have vegetable broth. Omitted the can of tomatoes and added one small can of beef broth. When the vegetables were soft enough, I used my blender to mash the vegetables. The consistency was like a beef chili. The cinnamon and cocoa make a lovely addition to the other spices. I make my own chili seasoning so I used that instead of the chili powder and cayenne. 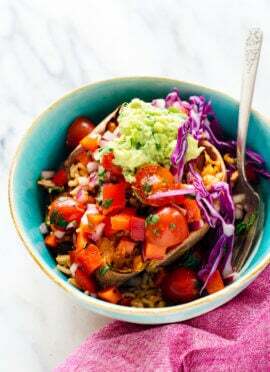 We topped ours off with a spoonful of guacamole and sprigs of cilantro. Thank you again. My husband and I are trying to loose weight and eat better. This will be my go to chili recipe from now on. Delicious!! I added some celery and a half a cup of quinoa and it thickened up nicely. I’m a guy who’s mostly too lazy to cook but I got sick of the pre-packaged “chili mixes” that turn out gross so I tried your recipe. Oh my God, this is soooooo good. I’m glad you tried it, Tim! I’m happy you think so, Kelly! Thanks for sharing! I’m happy it worked so well in the slow cooker. I love this chili!! I make it often for my boyfriend and I because it lasts us a while, and is very satisfying! I really like the addition of sweet potatoes, and I find that the cocoa and cinnamon create a great flavour dynamic. I highly recommend this recipe! Thanks for your recommendation, Grace! I’ve never tried chili with cocoa powder, so I was hesitant to try; however, after I searched and found other recipes including it, I figured it would taste good. Unfortunately, the cinnamon and just strange sweetness was all I could taste, even though this dish is quite spicy. I didn’t tell my family what was in it, but they almost immediately picked it out and said how strange it was. Probably not taking any more cooking risks for a while. I’m sorry you and your family didn’t love it! Thanks for the feedback, Sarah. My 3 year olds, 11 year old and all my guest absolutely loved this recipe. Making it again for dinner so thought I better comment. I just cut back on the chili powder and cayenne to ensure it wasn’t to spicy for anyone. Loveeeeee your recipes, you truly have a gift, girl. Thanks for coming back to comment, Nichelle! I appreciate the review. Delicious!! I added a little extra cinnamon because when it comes to cinnamon, that’s what I do. Also added a couple of carrots, just because. The flavor of this chili was spot on and I didn’t even miss the meat (I’m not vegetarian, just looking for a meatless, Lenten meal). Even the non-veggie loving person at the table enjoyed it. Fantastic, Theresa! Thanks for the review. LOVE THIS RECIPE! A friend recommended the recipe to me, and I made it for a chili cook off we were having at work. Won first place! WEE! So easy to make, completely stress-free deliciousness. Also cocoa powder in chili?!?!?! Who knew that was the key? Adds so much depth to the flavor. Thanks for sharing! I love this chili. I didn’t have regular chili powder so I used chipotle chili powder, which I reduced to a teaspoon or so since the one I have is really strong, but it added a nice smokiness. Would definitely make this again. I’m glad you love this! Chipotle would be a nice addition. Thank you for your review, Kate! I served this at work and everyone raved. Best chili ever!! The flavors are awesome. Thank you for this recipe. You’re welcome! A great one to share for sure. Great recipe! Re: your canned tomatoes note- I did some research and it seems like the levels of BPA in canned foods isn’t high enough to cause any concern, which is a relief! Thank you, Olivia for your review and sharing!